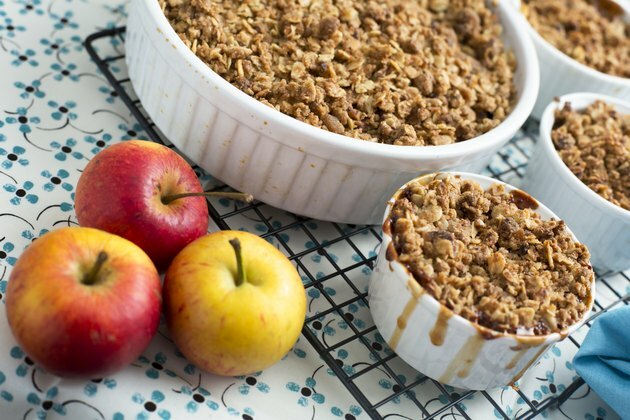 Warm and fresh from the oven with hints of cinnamon wafting through the air and enticing your taste buds to succumb to its gooey, crunchy bliss, apple crisp is hard to pass up. When the ice cream used to top it is put away and the full feeling has settled into your very happy stomach, the leftovers are waiting for you to address them. At this point it would seem like a tragedy to toss it out though you simply can't eat another bite. Leftover apple crisp should never go to waste. Storing it in the freezer can preserve it for the next time the craving strikes. Place the apple crisp into the refrigerator or in an ice bath to reduce the temperature quickly. Transfer the apple crisp into an airtight plastic container. Write the current date on a piece of tape and stick it on the container. Place the crisp into the freezer in a level location to prevent the crisp getting all pushed to one side and freezing onto itself. Use or discard the apple crisp before four months. When it comes time to reheat the apple crisp, place it into the refrigerator to thaw partially. After one to two hours, place it in the oven at 350 degrees uncovered for about 20 minutes. How Do I Make Apple Brandy at Home?